A blood knot (Barrel knot) is most usefully employed for joining sections of monofilament nylon line while maintaining a high portion of the line's inherent strength. Other knots used for this purpose can cause a substantial loss of strength. In fly fishing, this serves to build a leader of gradually decreasing diameter with the castable fly line attached at the large diameter end and the fly or hook at the small diameter end. 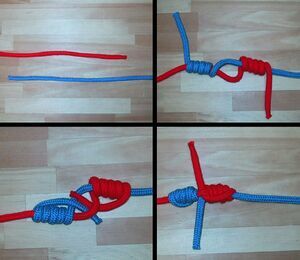 The principle drawback to the blood knot is the dexterity required to tie it. 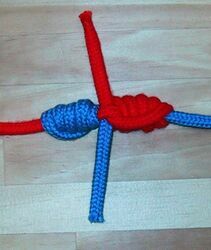 In tying the blood knot, the two lines to be joined are overlapped for 6-8 cm with the short ends of the two lines in opposite directions. The short end of one line is then wrapped 4-6 times around the second line and the remaining portion of the first short end brought back and passed between the lines at the beginning of the wraps. The short end of the second line is then wrapped 4-6 times around the first line and the end of this line brought back and passed through what is now an oval space between the first wrap of each set. The above method has been called by Stanle Barnes (Anglers' Knots in Gut & Nylon, 2nd ed., 1951) "outcoil", and is contrasted with the method that resembles the finished knot from the start, "incoil". The images here are incorrect to present the finished knot as having its free/"tag" ends go from the center of the knot to the extreme ends; they in fact will immediately coil around the standing parts towards the extreme ends. In fishing line, and in other material if not deliberately set snug and maybe re-set after some initial tensioning, the outcoil form will transform into the incoil form. This page was last edited on 19 November 2011, at 14:10.